Satu perjumpaan/dialog di antara DPPPJU dengan YB Lau Weng San (ADUN Kg. Tunku) telah diadakan di Dewan Ahli Majlis SS9, Sg Way. Tujuan perjumpaan adalah untuk mengukuhkan setiakawan dan gerak kerja menyalurkan maklumat-maklumat kerajaan negeri. Antara pimpinan PAS kawasan yang hadir ialah Hj Kamaruddin Suhaimi(TYDP @ Ahli Majlis MBPJ) dan Che Ku Abu Bakr Che Ku Mahmod(Ketua Penerangan). Beberapa program/cadangan yang memerlukan kerjasama seperti SPIES, Zakat, Tawas, Usia Emas. Selain itu, cadangan menubuhkan Majlis Pakatan Rakyat(MPR) akan ditubuhkan dalam masa terdekat. Dalam kegawatan ekonomi yang semakit gawat, kerajaan negeri Selangor selesa apabila diintai 2 pelabur Republik Rakyat China dan Amerika Syarikat yang berminat untuk melabur ratusan juta ringgit di negeri berkenaan. I support the move by the residents to retain the land as a reserve for public utilities (telecommunications purposes). During the previous state assembly, I urged the state planning authority to provide reserve land for public utilities (telecommunications purposes) for any development order in the future. Developers should also prepare high-speed fibre optic cables as part of the infrastructure development in addition to the normal infrastructure such as electricity, water, sewage facilities, telephone lines etc. The mushrooming of illegal telco towers and base stations are the effect of poor urban planning where the previous planning authority failed to anticipate the future needs of the country in terms of telecommunication. In view of the rapid development of the telecommunications industry, the state needs to urgently preserve land for public utilities (telecommunications purposes). The same goes for this reserve land at USJ6 Subang Jaya. Ramai pengamal undang-undang hari ini mempersoalkan tindakan polis yang telah melakukan pemeriksaan di Ibu Pejabat DAP di Seksyen 20/9 Petaling Jaya petang semalam dan mengambil beberapa bahan bukti termasuk komputer dan perisian yang disyaki digunakan untuk menerbitkan risalah yang mengandungi unsur hasutan. Polis berkenaan tidak mempunyai sebarang waran siasatan dan polis berkenaan boleh didakwa kerana trespassing (menceroboh). Menurut Ahli Dewan Undangan Negeri Kampung Tunku, Lau Weng San anggota polis tiba di ibu pejabat DAP kira-kira satu setengah lalu dengan menaiki tiga buah kenderaan. "Mereka datang dengan tiga kereta dan telah mengelindah pejabat DAP. Serbuan mereka tidak mempunyai waran dan polis juga telah membawa salah seorang kakitangan DAP ke balai untuk siasatan serta merampas peralatan komputer," kata beliau. Sebelum ini, ADUN Teratai, Jenice Lee, dan 15 lagi yang direman berhubung kes perhimpunan haram di bilik gerakannya kelmarin pada mulanya dijangka akan dibebaskan hari ini. Justeru ahli parlimen DAP Cheras, Tan Kok Wai bersama kira-kira 30 penyokong tiba di balai polis Pandan Indah, selepas jam 10 pagi tadi, untuk menyambut pembebasan wakil rakyat DAP itu. Peguam parti itu Wong Kai Phun – yang hadir kira-kira sejam sewaktu ADUN itu memberi keterangan kepada polis – mendapati tempoh reman selama dua hari hanya tamat esok. Bercakap kepada pemberita, beliau berkata seorang pegawai polis daerah Ampang Jaya, DSP Goh Lee Fook memaklumkan bahawa Jenice dan penyokongnya turut disiasat berhubung kesalahan melanggar Akta Penerbitan dan Mesin Cetak. Sebelum ini, dalam acara nyalaan lilin di bilik gerakan ADUN tersebut, DAP mengedarkan risalah dua muka berjudul "507 Detik Hitam dalam Sejarah Demokrasi Malaysia!" yang ditulis dalam bahasa Cina. Banyap pihak menyelar tindakan polis berkenaan dan menganggap ia sebagai penyumbang kepada kejatuhan kerajaan Barisan Nasional akan datang apabila rakyat ditekan dan ditindas serta diperlakukan sewenang-wenangnya oleh pihak polis yang tidak mengikuti undang-undang semasa menjalankan tugas mereka. Of late, police has been suppressing peaceful gatherings in a very high-handed manner. Two days ago, police even raided the DAP headquarters without any valid search warrant. Meanwhile, crime rate in Selangor does not seem any sign of significant improvement. Police still facing acute shortage of manpower. While the police is facing such problem, one would wonder why they could still mobilize the entire battalion to suppress peaceful gatherings, some not even exceeding 50 people in number? I observed that for the past few months, gatherings or even possessions organized by Selangor UMNO were not treated nicely by the police but the police were not seen on the spot to monitor their events. In other hand, peaceful gatherings by Pakatan Rakyat on various issues seemed to have received entirely different treatment from the police force, to the extend that some elected representatives were assaulted by the police. When the police has not been effecting in combating crime and continue to face the problem of acute shortage of manpower, resulting in alarming crime rate, civilians have worked together to employ security services, fence-up their community and set-up barricade at entrances of their community, though such actions are illegal under the act. At the local council’s level, some local councils with strong financial backup has applied officially from the police to setup their own auxiliary police force. Such initiative from the council is to assist the police in reducing crime rates. Paper works started as early as one year ago but the council is still waiting eagerly for the final approval from Bukit Aman Police Headquarters. This is the cause of the delay in starting up our auxiliary police force. What is more astonishing is that the Selangor Chief Police Officer (CPO) Dato’ Khalid Abu Bakar openly fired the State Government January this year that the Pakatan-led government is non-cooperative with the police. I wish to stress that enough is enough. For the past few years, we have been asking the police to improve their manpower, setting up IPCMC, discharging their duties according to universal human rights accord. Unfortunately, it seems like the police does not heed our requests even when some of these requests were proposed by SUHAKAM. Since the state government and local councils are willing to take up the police force, and the federal government failed to show any significant improvement in fighting crime, why not the federal government delegates the power to the state government in running the state police force, allocating funds to each state to run their police force according to the number of police personnel in their states respectively while maintaining an Investigation Bureau at the federal level, coordinating intra-state crime-combating investigations? Eleven police officers came to DAP HQ located at No. 24, Jalan 20/9, Taman Paramount, 46300 Petaling Jaya, Selangor just now at about 6:250pm together Ooi Leng Hang, 34, one of those who were detained in a candle light vigil in Pandan Indah. Ooi Leng Hang is a DAP councillor for Hulu Selangor District Council and is also a graphic and animation designer for the DAP HQ. He was brought hand-cuffed to the DAP HQ by the police, who came in three police cars led by ASP Kamal Khan bin Mohd Shariff from IPD Ampang Jaya. I was informed that the search was without a police warrant. One of our HQ staffs who were working then could not help but to allow the police to enter the HQ as the police officer only flashed his ID card in front of him without allowing him the opportunity to check the details of the ID card of the police officer. Then there was another officer requesting for the IC of our staff. It was also informed that the police came to search under Police Act. Police officers came and took away Ooi's CPU, LCD screen, keyboard, mouse, headphone etc. Several pictures were also taken inside the office. 19 DVDs and a portable hard disk were also taken away. Our staffs were then ensuring that unauthorized items which does not belong to Ooi were not taken away. Other DAP leaders, i.e Tony Pua, Gobind Singh, Ronnie Liu, Tan Kok Wai, Fong Kui Lun and me arrived later to assist. Question arise as to whether the police is authorized to carry out a search without any warrant. Gobind said that he asked ASP Kamal to let him under which provision of law that the search was conducted. ASP Kamal said at first he is conducting the search under Police Act, but Gobind rebutted that Police Act has no relation with such police search. ASP Kamal then called his colleague and was later told that the search was conducted under Printing, Press and Publication Act (APPP). "Under Section 16 of APPP, there is a requirement of search warrant but the police who conduct the search did not produce any search warrant and this had intruded civilians' privacy," Gobind said. The bout of arrests at the candlelight vigils being organized by DAP in Selangor and KL recently is perplexing. If BN/Home Ministry is intending to shut off further public exposure to the Perak issue, then the manner of arrests is being counter-productive to their cause as it is attracting national attention each and every night. It doesn't make sense as to why they keep doing this. It would be better for the police to keep low profile and let the vigils proceed. And having such heavy police presence, with OCPD of each district involved directly with each bout of arrest seem to indicate a hidden sinister motive. I can't help but feel that UMNO Selangor is behind this. We know that Najib is heading the state now. We must be wary of what is happening here. Najib can use the failure of Perak to orchestrate public disorder in Selangor, ultimately resulting in the fall of the Selangor state government. They may be taking advantage of the fact that only DAP is holding vigils. This is the perfect platform to create a racial unrest. If only DAP keep holding vigils, and the police keep up their clampdown, I believe very soon it will turn ugly. UMNO Selangor will be in the crowd. And when a provocation is engineered, and an incident is triggered, the blame will fall on DAP. This may be taking shape right underneath our noses now. The strategy to bring down Selangor will be more sinister than Perak, as part of a bigger plan to break-up Pakatan. DAP Selangor & KL must issue a directive to all MP/ADUN/branches. Either conduct legal assemblies or use unconventional strategies or joint-vigils with our Pakatan partners. I was on my way rushing to Pandan Indah yesterday and in fact I was late to the candle light vigil. In the midst of rushing to the event, a friend sent me a message that Jenice and others were arrested. It was another blatant attempt by the police force to breakup peaceful gathering organized by peace-loving individuals and elected representatives. “Kad Pengakuan Media Jabatan Penerangan Malaysia yang saya pegang tidak laku. Itulah yang dimaklumkan dengan tegas oleh anggota polis yang bertugas. Perhaps this could be correct, that this is what has been practiced by the police force, that when there is an order from the top, they have to obey and carry it out without any doubt. But let’s take a step back, aren’t the police force part of human being too? Orders, not matter how strict it is, must adhere to the principle of respecting human rights. Nonsensical arrests that the police made since 7th May only deepens the impression from the general public that this country has slowly turned to be a police state, no different from the Gestapo in Nazi’s Germany, the KGB during Soviet Union’s time and the many Secret Polices in Eastern European countries during Communist’s rule. The recent spate of nonsensical arrests remind me of what former Inspector-General of Police (IGP) said three years ago in a Human Rights Seminar organized by the police force targeting at Officers-In-Charge of Police District (OCPD). “Police personnel should have equipped themselves with knowledge on the Human Rights Act, the Police Act, the Criminal Procedure Code and other related laws when they completed their police training. “We taught you this, if you feel it is not enough, we will add more; and if it is still not enough, you better leave the force and find another job,” Mohd Bakri said when opening a course for OCPDs at the Royal Malaysian Police College in Cheras here yesterday. Bakri was puzzled why some police officers focused on trivial matters. "Why do we concentrate on things that are remeh-temeh (trivial) when there are more important things to do? Why find 10 men and shave them bald? "OCPD Kajang, I can tell you that if I drop by Kajang (district police headquarters) now, I can find 10 mistakes within an hour," said Bakri. But Mohd Noor Hakim was not the only one taken to task, although he was the only one named by the IGP. "We have been teaching you about human rights all along ... you cannot say we have not been teaching you. If this (three-day seminar) is not enough, then we can make it longer. "After that, if you still do not understand (about human rights), then you might as well look for another job. "We don't want stupid officers," he said. Bakri said the district police chiefs needed to stress human rights and how to treat the public to all their men, especially those manning enquiry desks and patrol cars. I think what Tan Sri Bakri Omar said three years ago are some very good reminders not only to us as general publics but also to the current leadership of the police force. Perhaps it is time for OCPDs to be sent back to school for such seminars again. Afterall, these seminars which Tan Sri Bakri Omar attended was held in Cheras Police Training Centre (Pulapol). It must be a very different feel if OCPDs were to be sent back to school again. 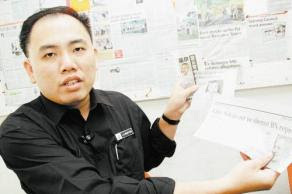 THE Petaling Jaya City Council will hold a dialogue session with the residents of Kampung Tunku and Taman Aman soon to try and resolve the controversy over the access route to Paramount View condominium and other traffic related issues. The condominium, located behind Jalan 22/44 in Taman Aman, is 90 per cent ready and would add to the perennial traffic problem in the old neighbourhood, residents say. It is estimated that there would be an additional 1,000 vehicles when the condominium is completed, aggravating traffic in the already congested Kampung Tunku. MBPJ deputy president Puasa Md Taib said they had discussed the matter of the access route with the developer recently, and their Infrastructure and Traffic, Planning and Engineering departments were studying various possible measures that could be implemented. “Once that is completed, we will call the residents living in Kampung Tunku for a briefing and they can give their views and concerns about the area. It will be chaired by Kampung Tunku State assemblyman Lau Weng San,” he added. However, Lau when contacted begged to differ with Puasa. He said the matter regarding Paramount View and the traffic situation affecting other residents should be held separately, as the issues were complex. Lau said there was a meeting last March where residents living close to the condominium together with residents from other stretches were invited to discuss the traffic problem in the neighbourhood. A resident, who declined to be named, maintained that the meeting Lau was referring to was strictly for those living within a 200m radius of the condominium, which were Jalan 21/27, Jalan SS1/25, Jalan SS1/26 and Jalan 22/44. No others were involved. “It is good to have the dialogue MBPJ is initiating as this issue has been dragging on for months,” he said. John Phung, a resident living along Jalan 1/22, said the traffic was extremely heavy in the mornings and evenings. “We hope to improve the area through this dialogue,” he said. Malay Mail had reported that Paramount View, a 12-storey condominium with 233 units equipped with a three-storey podium car park, among others, were built right behind a row of double-storey bungalows along Jalan 22/ 44, damaging the houses as a result. Residents along SS1/25 fear their stretch would be used as exit points for the development and they had objected to it since the affected roads are barely 30 feet wide and would not be able to cope with the extra traffic load. SHAH ALAM (May 21, 2009) : A dialogue today on a move by some local authorities in Selangor to stop retail outlets from selling beer and other alcoholic drinks reignited old arguments -- that such an order infringed the rights of non-Muslims and that other measures should be used to stop Muslims and minors from buying and consuming such products. Several quarters, including assemblymen and local councillors, spoke up strongly against sale restrictions during the dialogue between state officials, non-governmental organisations and stakeholders like wholesalers, hypermarkets and retail outlets. It was held to address problems arising from instructions from local authorities to retail outlets selling these products and protest from groups calling for a ban on the sale of alcohol in some areas. State executive councilors Teresa Kok, Dr Hasan Ali and Ronnie Liu, who were at the dialogue chaired by Mentri Besar Tan Sri Abdul Khalid Ibrahim, did not offer views but merely listened to the arguments. The issues will next be deliberated at the next executive council meeting on Wednesday. What triggered the matter was a letter from the Shah Alam City Council (MBSA) to retail outlets on May 13 stating that the sale of all alcoholic drinks including beer will not be allowed in Sections 1 to 25 in Shah Alam as the majority of those living in those areas are Muslims. The ban of sale of beer in such stores also covered outlets in Bandar Baru Sungai Buloh (Section U20) and TTDI Jaya (Section U2). It should be noted that beer is a social drink that does not require specific licensing for sale, unlike hard liquor. Kampung Tunku assemblyman Lau Weng San said this issue should not arise in one of the most developed states in Malaysia which has a 46% non-Muslim population. "It is worrying that overzealous local authority officers are taking it upon themselves to decide against the renewal of licences to sell alcoholic drinks at retail outlets, stores and even Chinese Medical Halls which sell herbal drinks with alcohol that have beneficial health properties," he said. He said a ban will not solve the problem, and that what is important is the inculcation of strong religious values. "If not, what is next...the ban of the internet because there is phornography? The ban of phones because they emit electromagnetic signals?" asked Lau. Sekinchan assemblyman Ng Suee Lim said: "Those who drink, like me, know that going overboard can have disastrous consequences. What is important is the strength of your spirituality because if you are strong in spirit, you will not be easily enticed (to drink in excess)." In a state that is made up of many races, the issue of a ban should not come up. Even Muslim majority countries like Indonesia, Turkey and United Arab Emirates do not have these kind of rigid restrictions, he said. Petaling Jaya City Council (MBPJ) councillor Michael Soon said the issue that should be addressed is the abuse and misuse of alcohol, not the sale of it, especially to youths and non-Muslims. He also pointed out that even countries and airlines from middle eastern Muslim countries do not impose such bans. "If you are going to argue about Muslim staff serving alcohol, then there should not be any Muslim stewardess employed on Malaysia Airlines as it serves alcohol, or at 7-Eleven outlets," Soon said, adding that the questions then arises over the employment of Muslims at hotels and other outlets which serve alcohol. A representative of Persatuan Pengguna Islam said the sale of alcohol should be banned in areas where there is a majority Muslim population, adding that handling of alcoholic drinks is also an offence for Muslims. Other residents association representatives and non-governmental organisation representatives expressed worry over the consequences and effects of excessive alcohol consumption, like drink driving. Earlier, 7-Eleven Malaysia Sdn Bhd executive director Ng Su Onn said the ban on sale of alcohol in several areas under its jurisdiction involved 37 of their stores. "We are disappointed with this decision and even though we are having a dialogue to address this problem, it seems like the decision has already been made based on the letter we received on May 13," he said. "As good corporate citizens, the company has abided by all laws and policies including the posting of very clear notices at all outlets barring the sale of alcohol to minors and Muslims." In addition, it is our policy that staff who sell beer to minors and Muslims will be fired, he said, adding that there have been such dismissals. "Currently Muslim staff at the counter handle alcoholic drinks using gloves," he said. When met after the dialogue, Ng said the company will continue with the sale of beer at its outlets until the state government states its stand. Some readers also called up theSun to lambast the move, on the grounds that it impinges on the freedom of choice of the non-Muslim rakyat. One said: "We did not expect the Pakatan Rakyat state government to handle this matter in such a way. During the general election, it had promised equality for all, and that it would take care of all races. This matter had been debated before; there was no need to bring it up again." PETALING JAYA (May 19, 2009) : Is the sale of beer going to be banned from retail outlets such as supermarkets, sundry shops and convenience stores in Selangor? It may be hard to imagine that one of the most multi-ethnic and liberal states would take an extreme approach towards addressing social issues but a high powered meeting to be chaired by Mentri Besar Tan Sri Abdul Khalid Ibrahim on Thursday will see this proposal being tabled. According to sources, the state government is against any form of banning the sale but has been under pressure by several groups, including PAS, to at least implement more stringent measures to control the sale of beer after midnight. "The problem is one does not need a liquor licence to sell beer which is the main alcoholic beverage being consumed," said a source. "Certain groups, PAS being one of them, are trying to push their own agenda to ban beer and liquor all together in Selangor. This is ridiculous as even in Kelantan, non-Muslims can buy beer from non-Muslim-run outlets," he said. It is understood that the proposal was mooted by several Selangor PAS leaders who had used several local authorities, including the Shah Alam City Council, as a conduit. The City Council had imposed a ban on beer sales in 24-hour retail outlets and has not allowed pubs to operate in some parts of the city. The legality of the ban is also in question. The meeting to be held in the state government building in Shah Alam will be attended by all heads of local councils, several state executive councillors, representatives of the two main breweries, liquor traders and retailers. Selangor Mufti Datuk Mohd Tamyes Abd. Wahid and Selangor CPO Datuk Khalid Abu Bakar will also be attending. Consumer groups such as Fomca and the Muslim Consumers’ Association have also been invited, as is the Syariah Lawyers Association. However, the absence of an invitation to the Bar Council appears conspicuous. If the proposal to limit the sales of beer is adopted, then the hardest hit would be 24-hour outlets such as convenience stores and some petrol marts, said a beer trader. "This does not make sense as one can still buy beer in Chinese coffee shops, some of which operate 24 hours as well," he said. Tesco Stores (M) Sdn Bhd director of corporate and legal affairs Azlam Shah Alias, who will be attending the meeting, said the hypermarket has fulfilled all requirements in selling hard liquour, such as creating a separate section, complete with a special counter. "We sell it until 9pm and when time’s up, we shut down our rollers, but for beer it is a bit tricky as it is the layman’s drink," he said when contacted. Azlam admitted it was going to be tough to meet in the middle where the sale of beer is concerned. "But we will see how best we can come to compromise in fulfilling our social obligations without affecting our business," he added. Meanwhile, state executive councillor for local government Ronnie Liu said the meeting was called to allow all stakeholders to have their say. "We cannot be too conservative in a multi-racial society but at the same time the state government understands the concerns of those opposed to the sale of beer after midnight," he said when contacted. Liu said there were concerns of people getting rowdy after drinking too much and supports a certain measure of control as long as it was practical and does not affect the rights of responsible individuals. "I believe in controlling certain things but we must be reasonable, that’s why I want this discussion to take place so that it will enable all quarters to understand the issue better and reach a compromise. "Even in Australia you cannot hold a can of beer and walk in the streets as there is a tendency to be rowdy, so that kind of control I am open to but to stop convenience outlets from selling beers totally is not a good solution," he said. Liu added that as there are other 24-hour outlets, any ruling must be fair and standardised or else the state will be seen as favouring some outlets while victimising others. Kampung Tunku assemblyman Lau Weng San will meet residents of SS3 every Friday, from noon to 3pm, at his service centre located above Medan Selera Wawasan, Jalan SS3/33, Petaling Jaya. His weekly meet-the-people sessions will be rescheduled to every Monday from 7.30pm to 9pm at the Sungai Way Service Centre, No: 96C, Jalan SS9A/3, Off Jalan SS9A/1, Sungai Way New Village and every Wednesday from 7.30pm to 9pm at the Paramount Garden service centre, No: 77, Jalan 20/9, Paramount Garden. For details, call 03-7875 4724. COMPANIES that have installed telecommunication towers without planning approval have better remove the structures themselves or the Petaling Jaya City Council MBPJ will do it for them and charge for the job. So far, one company has taken the initiative to take down two telco towers a day before the MBPJ enforcement personnel were scheduled to tear them down. Tetuan Packet One Network (M) Sdn Bhd saved itself from the embarrassment when it took down two telco towers in Jalan SS9A/2, Kampung Seri Setia. According to MBPJ Building Control Department assistant director Ismathinoon Rahman, the telco towers in Kampung Seri Setia had to be taken down as the company did not submit application to the council even though the structures conformed to the guidelines. The case was highlighted by Kampung Tunku assemblyman Lau Weng San following complaints from the nearby residents. According to Ismathinoon, a demolition notice was first issued on Nov 12 last year. The company made several appeals following that but they were rejected. The MBPJ then suggested an alternative site but the company turned down the offer. “Telco towers can be approved so long as the companies submit the required documents, have not receive objection from residents and adhere to the guidelines set by the Housing and Local Government Ministry and the Selangor government. Approval will be given in the form of a one-year temporary permit,” he said. The documents required include the building plan, an engineering report, an insurance policy and permits from Malaysian Communications and Multimedia Commission and the Konsortium Jaringan Selangor. Ismathinoon said the MBPJ had also launched a programme to remove telco towers that failed to comply with the guidelines. According to Ismathinoon, of the 241 telco tower sites in the city, 48 have been found to have violated the guidelines and they will be given demolition notices. Meanwhile, there are applications for 87 new sites. Ismathinoon said his team would take action against one telco tower in Jalan Gasing within a month while 10 others were under close scrutiny. Read about all the renewed controversy over the JPA scholarships recently? Dr Goh Cheng Teik, eminent academic, former deputy minister and interviewer for Harvard University admission programme in Malaysia will also be a special guest for the evening. In addition, for students and scholars who are not able to make it for the forum (e.g., if you are overseas or if you live outstation, you are welcome to submit written submissions to the panel. Please write to: dapscholarship (at) rocketmail (dot) com. Please forward details of the above forum to all parties concerned, especially those who have failed to secure scholarships despite outstanding results. We will be making a compilation of the complaints, appeals and suggestions made during the evening. Ketua Pembangkang, Datuk Seri Anwar Ibrahim berkata kemelut politik di Perak bukanlah isu perundangan yang boleh diselesaikan di mahkamah. Sebaliknya, beliau yang juga ketua umum PKR berkata, ia hanya boleh diselesaikan melalui pilihanraya yang bebas dan adil. "Penyelesaiannya bukan pada istana atau mahkamah, tetapi mahkamah rakyat yang akan menentukannya," katanya. Sehubungan itu, Anwar mencabar Perdana Menteri, Datuk Seri Najib Tun Razak supaya mengadakan pilihanraya baru di Perak bagi menyelesaikan kemelut politik sekarang. Apabila beliau bertanya mengapa Najib perlu takut untuk mengadakan pilihanraya baru di Perak, kira-kira 3,000 hadirin yang memenuhi dewan tersebut melaung: "Takut kalah". Najib dikaitkan dengan tindakan BN merampas kuasa di Perak dari Pakatan Rakyat. Anwar yang juga ahli Parlimen Permatang Pauh menegaskan demikian dalam satu forum di Dewan Sivik Majlis Bandaraya Petaling Jaya malam tadi. Tajuk forum tersebut bertajuk 13 Mei hingga 1 Malaysia: Masa depan pembinaan negara Malaysia, anjuran pejabat ADUN Kampung Tunku, Lau Weng San. Ahli panel lain ialah pemimpin veteran DAP, Lim Kit Siang yang juga ahli Parlimen Ipoh Timur serta Menteri Besar Pakatan, Datuk Seri Mohammad Nizar Jamaluddin. Ketibaan mereka menerima tepukan gemuruh para hadirin. Kemelut politik antara BN dan Pakatan Rakyat semakin parah apabila jawatan menteri besar salih berganti disandang oleh wakil kedua belah pihak. Sidang DUN Perak pada 7 Mei lalu juga menyaksikan berlaku kekecohan dan pergaduhan antara kedua belah pihak, termasuk insiden Speaker V Sivakumar diseret keluar DUN. Sebelum ini, BN mengambil alih pentadbiran negeri Perak selepas mendapat sokongan majoriti apabila tiga ADUN Pakatan keluar parti dan menyokong BN. Ekoran itu, Nizar Jamaluddin membawa kes itu ke mahkamah dan kelmarin Mahkamah Tinggi Kuala Lumpur mengisytiharkan beliau sebagai menteri besar Perak yang sah. Berikutan keputusan tersebut, Menteri Besar BN, Datuk Seri Zambry Abd Kadir dan exconya mengosong pejabat dan Nizar kembali bertugas. Bagaimanapun, Zambry berjaya mendapatkan perintah mahkamah untuk menangguhkan penghakiman mahkamah tinggi itu dan kembali bertugas semula semalam. Mengulas lanjut mengenai kemelut di Perak itu, Anwar menyifatkan Nizar sebagai "bendahara Tun Perak yang baru". Mengenai 13 Mei pula, Anwar yang berucap selama 15 minit berkata, selepas peristiwa tersebut, pelbagai slogan perpaduan dilaungkan - termasuk Islam Hadhari dan 1Malaysia - tetapi menurutnya tidak ada sebarang perubahan dasar. "Malaysia tidak perlukan slogan baru, tetapi dasar dan program baru kepada seluruh rakyat Malaysia," katanya. Katanya, program dan dasar yang diperkenalkan mestilah mengambil kira kepentingan seluruh rakyat Malaysia pelbagai kaum, terutamanya yang miskin dan terpinggir. Sementara itu, Kit Siang menyifatkan tanggal 7 Mei sebagai 'hari yang memalukan; dan sebagai 13 Mei yang baru apabila SpeakerSivakumar diseret keluar daripada DUN Perak dan stesen TV dilarang menyiarkan gambar insiden tersebut. "Tiada lagi 13 Mei, tetapi 7 Mei - hari yang memalukan," katanya, sambil menyifatkan pelik keputusan Mahkamah Rayuan membenarkan penangguhkan keputusan Mahkamah Tinggi - yang mengisytiharkan Nizar sebagai menteri besar Perak yang sah - dalam masa yang singkat. Beliau juga menyindir Zamry sebagai "3 in 1" -- Mandela-Gandhi- Zambry. Lim juga menyelar rencana di Utusan Malaysia baru-baru ini yang berjudul "Malaysia di ambang republik". Katanya, tulisan berunsur "hasutan, fitnah dan dusta" itu patut diheret ke mahkamah. Sementara itu, Nizar pula berkata, 13 Mei dan politik perkauman wujud akibat warisan penjajah sebelum merdeka. Katanya, keharmonian kaum sejak ratusan tahun di Malaya sebelum itu, antaranya melalui hubungan perdagangan, tidak mempunyai sebarang masalah. Menteri besar Pakatan itu mendakwa, Umno menjadi penerus kepada politik perkauman penjajah. Katanya, kerajaan Perak yang diwakili ADUN pelbagai latarbelakang kaum, jantina dan profesyen, telah berjaya menjamin keharmonian pelbagai pihak - tidak seperti yang berlaku di Terengganu. "Di Terengganu, semua ADUN Melayu, orang Terengganu makan nasi dagang, tetapi bergaduh tidak selesai sampai sekarang," katanya merujuk kepada konflik majoriti ADUN BN menolak kepimpinan Menteri Besar, Datuk Ahmad Said. Mengulas mengenai kepelbagaian latarbelakang, beliau turut menyebut tentang terdapatnya "satu wanita dan dua lelaki lompat" sambil disambut sorakan "boo" penonton. Katanya, konspirasi BN di Perak bermula sejurus selepas kemenangan Pakatan dalam pilihanraya umum lalu, dengan tawaran wang berjumlah jutaan ringgit kepada ADUN Pakatan supaya melompat parti. KUALA LUMPUR: Pakatan Rakyat’s (PR) leadership will be meeting today to discuss a possible meeting with Prime Minister and Barisan Nasional (BN) chairman Datuk Seri Najib Razak, said DAP stalwart Lim Kit Siang. “It is time for Najib to meet with PR leaders to find a solution to the Perak crisis because it concerns not only Perak but it is a national crisis of all institutions — the police, judiciary, Election Commission, MACC (Malaysian Anti-Corruption Commission) and on the PM’s image and legitimacy,” he said after the From 513 to 1Malaysia, The Future of Malaysian Nation Building forum here last night, which was organised by Kampung Tunku assemblyman Lau Weng San. Datuk Seri Mohammad Nizar Jamaluddin, who was a panellist at the forum, said there was no solution to the political impasse in the state except through the dissolution of the state assembly. 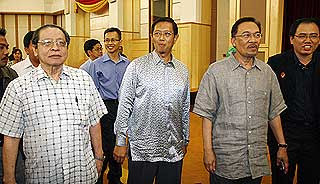 “The longer the impasse in Perak, the worse it will be for Umno. Umno is like a person with fishbone stuck in the throat,” he said, adding that Datuk Seri Dr Zambry Abdul Kadir had not succeeded in having the assembly sitting “under the tree” nullified by the Federal Court. Nizar accused Umno of practising racism and intimidation. “Umno continues to use May 13 to scare people at every election to ensure that the people dare not change the government,” he told a 3,000-strong crowd. Opposition Leader Datuk Seri Anwar Ibrahim, in his opening address, said Perak was not a legal issue that could be resolved in court. “Our (PR) common resolve is to demand a fair and free election in Perak now. The solution is not in the palace or court of law but in the court of the people,” he said. PETALING JAYA, May 14 — Four decades after the country’s worst race riots, DAP parliamentary leader Lim Kit Siang has urged all Malaysians to forget the bloody clashes of May 13, 1969 and instead replace it with the memories of last week’s state assembly debacle in Perak. ”Let us exorcise the spectre of May 13 and replace it with the May 7 image of Speaker V. Sivakumar being forcibly dragged out by Umno’s police,” the veteran politician told an overflowing civic centre crowd here last night. The ban he referred to was apparently given to Media Prima, the group which controls the country’s four free-to-air private TV stations — TV3, NTV7, 8TV and TV9 — on the evening of May 7. Lim was speaking last night at a public forum “From 513 to 1 Malaysia: The Future of Malaysian Nation Building” organised by the office of Kampung Tunku state assemblyman Lau Weng San to mark 40 years since the May 13 riots. Amid an all-star line-up which included opposition leader Datuk Seri Anwar Ibrahim, Bukit Gantang MP Mohammad Nizar Jamaluddin, DAP vice chairman Tunku Abdul Aziz, retired judge N.H. Chan and Bar Council chairman K. Ragunath, Lim reminded the crowd that the BN government had used May 13 as a haunting tool to divide Malaysians for 40 years. “This allowed them to spawn corruption, suppress human rights and turn our country into a nation of mediocrity. Two million of our best and brightest went abroad, much to our loss. “We must remember May 7 until we have removed the hegemony of Barisan Nasional,” he said to thunderous applause and shouts of agreement. Sempena memperingati ulang tahun ke 40 puluh peristiwa 13 Mei, pejabat ADUN Kampung Tunku Lau Weng San akan menganjurkan sebuah forum yang bertajuk “From 513 to 1Malaysia – The Future of Malaysian Nation Building”. Tempat: Dewan Sivik, MBPJ, Petaling Jaya, Selangor. Jamuan ringan akan dihidangkan dan semua dijemput hadir. In commemoration of the 40th anniversary of May-13 incident, my office will hold a public forum entitled “From May 13 to 1Malaysia – The Future of Malaysian Nation Building” on 13th May 2009 (Wednesday), 8.00pm in Civic Hall, MBPJ, Petaling Jaya, Selangor. Parliamentary Opposition Leader, YB Dato' Seri Anwar Ibrahim will be delivering his opening speech for the forum. Bearing in mind the nation’s difficult past, the objective of this forum is to enable a group of Malaysians from different background and of different era to explore together a Malaysian future that will become our common destiny. Tricia Yeoh Su-Wern (Research Officer of Selangor Menteri Besar’s Office). Each panelist will be given 10 minutes to lay out her/his ideal Malaysia future, and the audience will have opportunity to voice their own versions of “1Malaysia”. The forum will end with each panelist given 10 minutes to wind up her/his speech. Light refreshment will be prepared. All are welcomed to attend this forum. First, police detained Wong Chin Huat under Sedition Act. Second, 14 people including Serdang MP Teo Nie Ching were detained outside Bricksfield Police Station for "illegal assembly". Third, police also detained 69 Pakatan Rakyat supporters and commoners on 7th May 2009 outside the Perak State Assembly building. Fourth, police after that crashed into the State Assembly unlawfully and dragged Speaker, YB Sivakumar away and locked him up unlawfully for hours in a small room. Fifth, even officers of court (justice), lawyers, are not spared. Five lawayers detained outside Bricksfield Police Station when they offered legal aids to Wong Chin Huat's supporters who gathered outside the police station. The lawyers were detained for the same reason, "illegal assembly" although they were not part of the candle light vigil but merely providing legal assistances. Even I myself were assaulted and detained by the police months ago. These are some counts of human rights vilations that the police commited. How many out there which are not reported? I do not know but I am sure the number is countless. And day by day, we see crime rate skyrocketing. We need more policemen and women on the street to safeguard the safety of the people, but there are always reasons given: insufficient manpower, insufficient equipment, insufficient salaries. No doubt all these insufficiencies are true or could be true, but I think the major insufficiency that the police force faces is insufficient brain in the top management. THE developer of Paramount View Condominium will have to meet all the criteria set by Petaling Jaya Municipal Council before it can get its Certificate of Fitness (CF). Although it is their prerogative to apply for the CF, they must settle all outstanding matters following the dispute with surrounding residents over the entry points to the condominium, said the council’s deputy president Puasa Md Taib. “Foremost, they have to settle the access road to the condominium issue first before we can give them any approval,” he told Malay Mail yesterday concerning the developer’s statement that they would be applying for a CF soon. The project, comprising a 12-storey block with 233 units, is located some 30 feet behind four double-storey bungalows along Jalan 22/44 in Taman Aman, Petaling Jaya. Residents there claim the proximity violates the local authority’s building by-laws. Puasa stressed if the developer did not solve these problems, they should not submit the application for the CF. 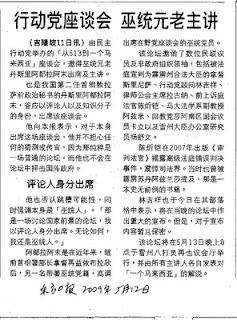 On April 17, Malay Mail reported that the developer Sri Aman Development Sdn Bhd, claimed they had obtained the approval to use SS1/25 as the entrance in 1993 and 2005 and that residents had no right to deny them of this access route. Malay Mail had also reported that owners of four bungalows had demanded an estimated RM4mil in compensation from the developer for damages to their homes. One resident, who declined to be identified, said the council’s Engineering and Town Planning Department had visited the area and wanted the developer to fix the damages to the bungalows and construct a wall behind the affected houses as requested. The council also requested the developer rectify the ineffective drainage system and repair roads in the vicinity which had become riddled with potholes. A photo exhibition depicting the history of new villages will be held at the Sungai Way Community Hall in Petaling Jaya from 10am to 4pm on May 10. The main objective of the exhibition, held in conjunction with the 61st anniversary of the new village in Malaysia, is to educate the younger generation about the origins of new villages. Some of the activities lined up as part of the event are a story-telling session by senior citizens from the new villages, quiz and colouring competition. The exhibition is organised by the Kampung Tunku assemblyman service centre and new village development and illegal factory task force committee together with the KL and Selangor Chinese Assembly Hall (KLSCAH), Petaling Jaya city councillor Tiew Wan Keng’s office and the Sungai Way Village Security Development Committee. According to Kampung Tunku assemblyman Lau Weng San, at least 10 series of the photo exhibition will be held throughout Selangor. He said most of the photos were contributed by the KLSCAH as well as the villagers from Sg Way. “The Sg Way villagers witnessed the massive development that took place here including the construction of the Federal Highway. “The villagers were also the main labour force behind the construction of the highway and Subang airport. “Sg Way was one of the first areas to be developed in the Petaling district. It was initially surrounded by tin mines and rubber estates,” he said. Lau encouraged parents to visit the exhibition with their children so that they would know about the history of new villages and appreciate what they had now. Perak State Assembly turned into a gathering of gang-fights today. Malaysia and Perak become the laughing stock of the whole world. The way Perak State Assembly Speaker YB V. Sivakumar dragged out forcefully from his chair and the State Assembly is most outrageous and shameful. How are we going to call the House as "Dewan Yang Mulia", when we can allow outsiders to rush into the chamber and drag the Speaker away? What law we have in Malaysia? The police personnels, the IGP, and fake speaker, the CPO and the OCPD must pay for their act of contempt of constitution. This is the highest level of contempt to the State Assembly that I have never witnessed before. Please do not call Malaysia a democracy now, at least not in Perak, my homestate, because democracy is dead in Perak at the moment. Only the living people in Perak are able to revive it through a free and fair state election. Coming back to Selangor, we still have a lot to do. The doctrine of separation of powers must be quickly instilled in the heart-and-minds of our civil servants. There should be no mercy for those who could not perform, even if we have to remove them immediately, do it by all means. Even if it has to cost us compensation in the court, do it by all means. If you ask me whether the Pakatan state governments can still work with Federal Government agencies, I am now doubting it very much. If you ask me whether I have confidence in the police force, I am doubting it very much too.